The Energy Advice in Detail publication provides an annual analysis of the energy issues on which consumers in Scotland seek advice. 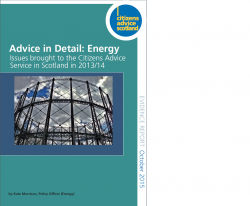 The Citizens Advice Service in Scotland advised on a total of 21,101 energy issues in 2013/14, an increase of almost 50 per cent from the previous year. Of this figure, clients took 18,330 energy issues to their local CAB and contacted the Citizens Advice Consumer Service (CACS or “the helpline”) with a total of 2,771 energy issues. From the body of evidence gathered in this report, CAS highlights ten key areas where it appears that the energy market is not serving consumers effectively, or where it is clear additional support is required to ensure that consumers are not disadvantaged by an inability to engage with the market and/or to heat their home. Service Standards are too often below the reasonable expectations of consumers. Throughout our evidence it is clear that recurring issues such as long call waiting times and billing errors cause significant detriment to those affected. Throughout our case studies, the impact of reforms to the social security system is tied intrinsically to a household’s ability to sufficiently heat their home. Those who have been sanctioned or had their social security payments altered may be additionally disadvantaged by accruing debt or becoming disconnected from their energy supply. Case evidence presented to our service suggests that people in vulnerable situations are not always receiving the support they require. Furthermore, the services that can be made available through Priority Services Registers are not always delivered. Schemes such as the Warm Home Discount are not accessible to all eligible consumers. Our evidence shows that barriers such as online registration, annual applications or limited windows for registration can prevent certain households from accessing this support. Our case studies highlight that certain groups of consumers may receive a second class service for their energy account, owing to factors such as the meter their household uses or the way they heat their property. In particular, people with pre-payment meters, time-of-use meters, electric heating or non-regulated heating systems may not be able to access the same pricing, ability to switch, support or protections that are available to other consumers. Our case evidence highlights a number of issues with debt collection processes. Repayments are often set too high for consumers to afford and implemented without due consultation. If a debt is transferred to a collection agency, the additional costs added can be disproportionate and unaffordable. Households who do not heat their home with mains gas require greater financial support. Consumers attending CAB reported that they were unable to afford to fix their off-gas heating systems if they become faulty or broke down and were frustrated to find that they could not access support owing to the type of heating system available to them. Some of the early adopters of smart meters have found that they are unable to realise the benefits of these systems. Conversely certain groups of consumers are aware of the benefits that they may offer to them but are not yet able to access the technology. Well intended changes to the energy market such as changes to the rules around standing charges have had some adverse effects on households. A significant body of our evidence suggests that changes to the rules are often implemented in a manner that disadvantages consumers. Small businesses contacting our service may be disadvantaged by the rules surrounding business energy contracts, such as a lack of a cooling off period for them to confirm whether they have received suitable terms of service.